Last week, the Stock markets took a sharp sudden fall and left many investors shell shocked. Two things led to sudden sharp fall. 2. The Shell Companies issue raised by SEBI. This Client started investing just about a month back. She had done a single investment last Nov and then restarted only last week. Last week's sudden brutal fall hit the portfolio valuation hard and showed a loss of Rs.7500/- and a negative CARG of -4%. Its obvious that the client would get upset on seeing a RED portfolio especially wherein one Fund is showing a CAGR of 33% and still the overall portfolio is showing a negative 4.1%!! Just 1 single day later. The Portfolio has moved from a loss of Rs.7500 to a Profit of Rs.13700 and a negative CAGR to a positive CAGR of 7.3%. All in a matter of one single day!! 2. Equities is NOT for Short Term. Never was. Never will be. 3. Positive Growth is a given. Equities have outperformed all other asset classes by a reasonable margin but the problem is VOLATILITY. You have to bear with it. 4. 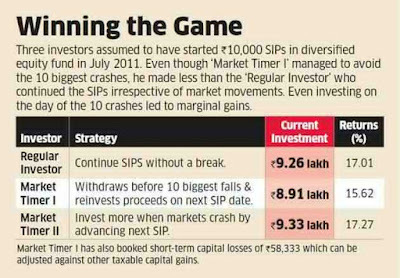 When the Investment is LONG TERM, why should you even bother to look at your portfolio?? You will only be increasing your BP. 5. Stick to Asset Allocation. Stick to Good Quality Funds. Invest in Funds which are aliging to your Goal. 2. Dont listen to CNBC/ETNOW experts. They find pleasure in making you nervous. 3. Take the Advise of a Good MFD/Advisor who will guide you after looking at your Goals. 4. If the Horizon is Long term, treat the Falls as an Opportunity to buy Quality Funds at lower rates and reduce your overall Cost of Purchase. Relax. Enjoy the ride but be warned the ride could be bumpy. And let the MAGIC OF COMPOUNDING WORK to your advantage. Great information, I am very thankful to you for this information.I got good knowledge from this website.I am truly not aware about these information. Thanks for this opportunity to discuss here. I am from panseva service provider, visit to get any kind of help from us.